Solomina M. Darko The Film Studies Library is part of the Department of Visual and Environmental Studies and is located on the fourth floor of Sever Hall. Two full-size VHS players — the kind that elementary school teachers used to wheel into the classroom — rest like gentle giants on a white counter. When I enter the room for the first time, the only sound is my own slightly elevated breathing. I have trekked four flights up the Sever South stairway to find myself in a dimly lit, scarcely populated space where little moves except for the privileged few who are already there. They are not privileged because of any personal achievement or institutionally granted advantage; no, they are privileged simply because they know this place exists. I am standing in the belly of Harvard’s best kept non-secret: the Film Studies Library. The library is part of the Department of Visual and Environmental Studies, but it is not situated in the Carpenter Center for Visual Arts. It lives on Sever’s fourth floor, where it maintains a non-circulating collection of DVDs, CDs, books, PS-4 games, and periodicals — none of which have been digitized. I walk into the library at 2:53 pm, 53 minutes after it opens, and look around. Brightly illuminated to my left are a large desk, a wall of movies protected by plastic sliding doors, and a cream-colored table where a student sits. He is also dressed in cream. To my right, the rest of the room is incongruently dim, though this is probably because only one light is functional. There is a set of two back-to-back black leather (or pleather?) couches, two more black leather (pleather?) chairs in a strangely rounded corner, and a number of black bookshelves. I sit in one of the two chairs, a vantage point that allows me to survey the entirety of the library. I’ve decided that all the seating is pleather. I’ve been emailing Colin S. Smith, the library coordinator for the Film Studies Library, and he soon approaches me. I’m not hard to find, considering I’m the only student in the library besides the guy in the cream sweater, who Smith later informs me works for the library. Smith describes the library as a non-circulating collection primarily supporting the VES program. The majority of the resources in the library are unavailable in other spaces on campus, and most were acquired after being specifically requested by faculty who needed them for a specific course. The VES department hires students to staff the library, and there’s only one requirement: They can’t be colorblind because the library organizes its reserve film section by color-coordinated stickers. I asked roughly 10 students about the Film Studies Library, and not one was unaware of its location. Even the most technologically savvy students have to visit in person to access its resources, as its collection is not catalogued on HOLLIS. When Smith insists I see the viewing area, I imagine an IMAX theater hidden in the back corner of Sever. Instead, I find a long, thin tunnel with white walls where two full-size VHS players — the kind that elementary school teachers used to wheel into the classroom — rest like gentle giants on a white counter. The other six devices on the counter are a mix of similarly ancient forms of entertainment consumption technology: CD players, DVD players, and two PS-4s. So what kind of a space is this library supposed to occupy in a campus full of students who have no idea it exists? 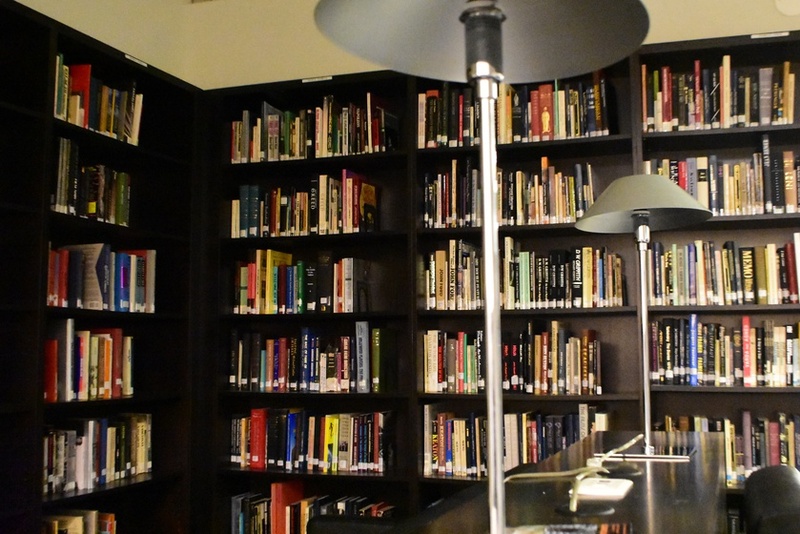 Smith sees the library’s collection as reflective of its individuality. “We’ve built an extremely idiosyncratic collection and there’s a lot of stuff that’s just not available anywhere else,” he says. After our interview, I stay in the library to study, sitting on one of the pleather couches for so long I convince myself that I can hear the air being pumped into and out of the room. I am the only non-employee in the space the entire time. Sitting among VHS players, DVDs, and silence, rapidly typing on my computer, I feel a little bit out of place. But maybe we all need a little more of this in our lives: a space in which, among a world of Google Calendar, Netflix, and frenzied rushing from one activity to the next, time seems to pause. When I leave at 5:16 p.m., the loudest noise I’ve heard in the past two-plus hours is the sound of our interview, a welcome change from the chatter of Sever’s crowded halls.